Staring at a handful of pills and ready to end her life, Maggie (Kristen Wiig) gets a phone call that her estranged twin brother Milo (Bill Hader) has attempted to commit suicide himself. The two twins have not seen each other in 10 years, but she immediately flies to Los Angeles to visit him in the hospital. Maggie suggests that Milo come back with her to their hometown in New York, where she never left and is now married to her husband Lance (Luke Wilson), so that he can clear his head. He reluctantly agrees. The two twins may be getting more than they bargained for as past secrets are revealed, present screw-ups are uncovered, and future lives are put to the test. 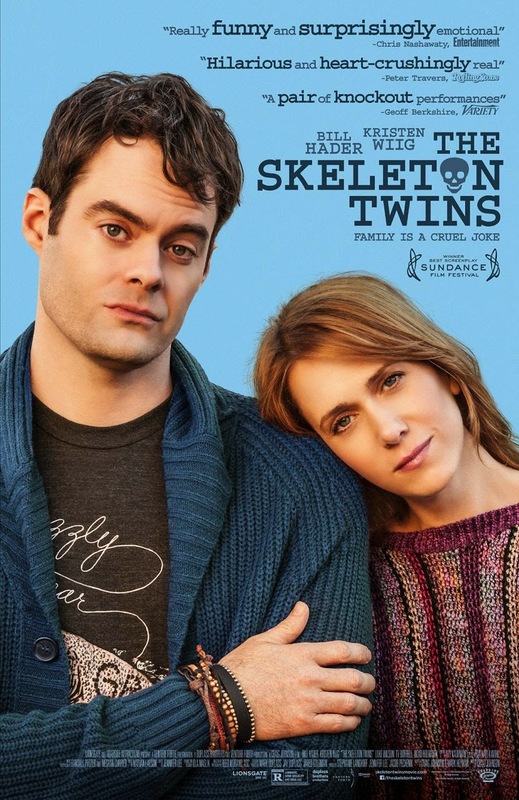 Kristen Wiig and Bill Hader, reunited and it feels so good...even though this movie is super depressing. While the plot of this film in and of itself is rather simplistic, the acting is what makes it worthwhile. Kristen Wiig and Bill Hader are both extremely compelling and believable as twins who are almost each other's soul mates, but Hader truly steals the show here. We have seen him be funny, but dramatic roles are where he excels, and this is proof positive. He plays his character Milo with such resounding conviction and such purity, though he is, as he describes it, "a walking gay cliche." Kristen Wiig plays the guilty, restless housewife very well, battling her inner demons by projecting her problems onto her twin brother. Watching them try to repair their broken relationship, that has many layers, is both funny and sad at the same time. They must find the balance between forgiveness and acceptance and come to a mutual understand of one another's lives. Much of the success of their relationship banked on Hader and Wiig's shared history, both alumni from "Saturday Night Live," and real life friends. Luke Wilson holds his own as well, and he's really the only likable person we encounter in this movie. He's just an all-around good guy, even if that makes him simple, boring and undesirable to a point. Here, we have another example of a more specified human interest/life story where BigJ and I have a difference of opinion. Where he saw nothing more than a dark dramedy, I saw a poignant piece of truth telling. The anguish, the heartbreak, the confusion, the undying love between siblings, every single emotion Wiig and Hader portray was met with great success, in my opinion. The movie as a whole deals with intimate and often touchy issues such as suicide, estranged family, infidelity, underage relationships, and family secrets. Each family has them, and this one does in spades. People go to the movies to escape real life, this is a fact. But, movies like this, ones that speak to the heart and get deep down into the soul of people, ones that don't get heavily marketed because they teeter on the line between drama and comedy, these are the movies I love to watch and love to constantly be surprised by. This movie also contains one of our top 5 favorite scenes of the year thus far. The part where Milo begins singing "Nothing's Gonna Stop Us Now" by Starship to an unwilling Maggie, I laughed so hard I had tears in my eyes, and I don't know if it was from the humor behind it, or the overwhelming sense of joy I felt from knowing that most siblings eventually make it work, regardless of their present quirks or past misunderstandings. One of the best parts of this movie is its name itself. 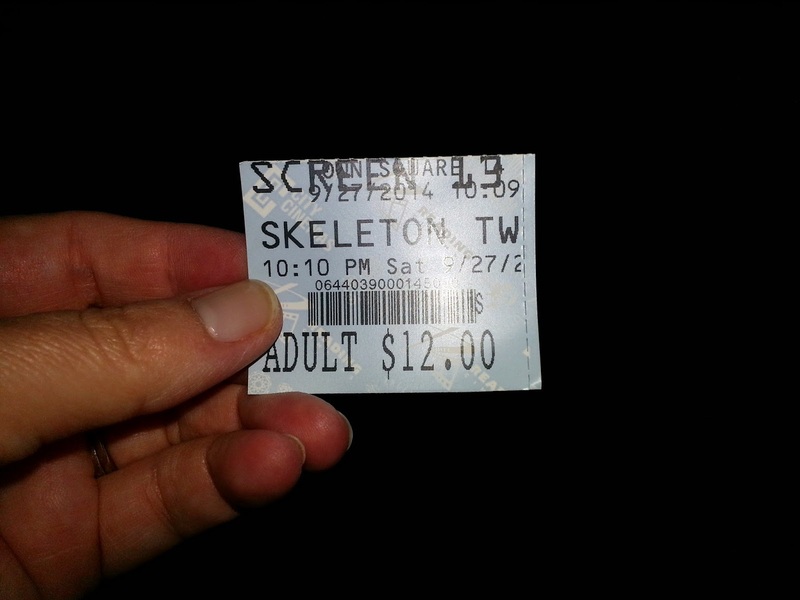 It's a double entendre, as their father had given them skeleton toys as kids, and yet Maggie and Milo also grew up with a closet full of skeletons. Intriguing! All in all, while I liked it more than BigJ, he still saw the redeeming qualities it had and enjoyed it overall, but wasn't blown away. Me? I would love to see more movies like this, and I enjoy when comedic actors and actresses cross over into a different type of role, even when the movie is agonizing and forces you to think about your real life, as opposed to a film where you can escape for an hour and thirty minutes. One year ago, we were watching: "Captain Phillips"